WSU has developed a new class of contrast agents that are effective at ultra-high field strengths (>3 tesla) in magnetic resonance imaging (MRI) where current clinical agents severely decline in effectiveness. Our new agents are based on the metal Eu(II) which is novel compared to current agents that are based on Gd(III). The difference between the two metals leads to increase in effectiveness (higher relativity) with increasing field strength between 1.4 and 9.4 tesla for Eu(II) agents where current Gd(III)- based technology decreases rapidly in effectiveness over the same field strength range. Higher field strengths are desirable because they offer greatly improved signal-to-noise rations, resolution, and scan times. A range of unique Eu(II)-containing complexes have been developed including the most oxidatively stable aqueous Eu(II) complexes known to date and tested in animal models. Currently used Gd(III) contrast agents are not effective for next generation ultra-high field MRI (>7 Tesla). Because gadolinium-based contrast agents have serious safety concerns for patients with kidney disfunction, increasing dosage at higher fields is not an option. New contrast agents with improved safety and efficacy as well as possible environmentally sensitive versions are enabled by the WSU technology. “Interaction of Biphenyl-Functionalized Eu(2+)-Containing Cryptate with Albumin: Implications to Contrast Agents in Magnetic Resonance Imaging.” Inorg. Chim. Acta 2012, 393, 324–327. 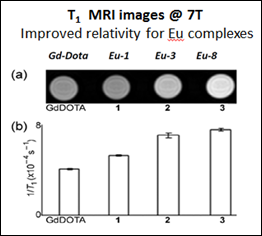 “Physical Properties of Eu(II)-Containing Cryptates as Contrast Agents for Ultra-High Field Magnetic Resonance Imaging.” Eur. J. Inorg. Chem. 2012, 2012 2135–2140. “Eu(II)-Containing Cryptates as Contrast Agents for Ultra-High Field Strength Magnetic Resonance Imaging.” Chem. Commun. 2011, 47, 12858–12860.